AFC Bournemouth were undone by Liverpool's attacking machine as they were beaten 3-0 on Merseyside, a result to send the hosts back to the Premier League summit. Following an open start, the hosts took the lead when Sadio Mane was able to find just enough space to head home from seven yards. Georginio Wijnaldum doubled the advantage with a delicate lob, which meant the Reds had a two-goal lead at the break. 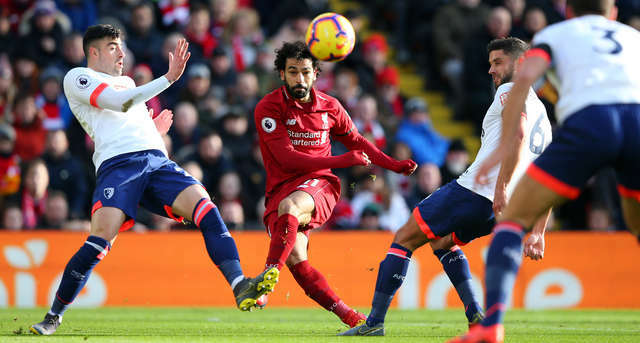 Mo Salah scored his sixth in the last two seasons against the Cherries with a smart finish moments into the second period, with the Cherries battling for a way back into the game in the final half an hour but not able to find one as their disappointing away run continued. Starting in their white away jerseys, there were three changes from the off at Anfield, fit again Jefferson Lerma joined by Jordon Ibe and Diego Rico in the 11, with Nathaniel Clyne’s absence, as a player on loan from Liverpool, meaning Adam Smith switched flanks to start on the right of defence. The Cherries burst out following the starter’s gun and when Ibe found Ryan Fraser just inside the box, the Scot aimed for the far corner and may have found it but for Alisson’s diving intervention. It was a good save to deny Fraser who looked to have curled the ball past the Brazilian's reach. Liverpool were soon enjoying the lion's share of possession, prodding and probing at the Bournemouth backline. Salah fired over as he cut onto his left and fired in a shot from 16 yards, Roberto Firmino then forcing a good close-range save from Artur Boruc as the Pole spread himself in front of the striker. A further Salah shot flicked up off Andrew Surman's leg and into the 'keeper's grasp, though the Cherries were showing their ability to break, Fraser seeing a shot charged down and Ibe twice finding space if not quite his man when in the box. However, the deadlock was broken in the hosts' favour just past the halfway point in the half when Mane scored with a header. James Milner, stationed at right-back, was played the ball on the flank, the experienced England man swinging in a cross that his Senegalese team-mate was able to easily nod home from a position just beyond the near post, suspicions of offside ignored by the officials. Within ten minutes the lead became two, Wijnaldum producing a moment of real magic. Andrew Robertson dinked in a ball into the area and bouncing and with a defender in front of him, the Dutchman's inspired thought process saw him loft a finish over Boruc and under the crossbar to tighten Liverpool's grip on the game. Lerma fired over from 25 yards on the stroke of half time, with the away side requiring a big turnaround in the second half if a result was to be secured. Three minutes after the restart and the gradient of the turnaround task became even steeper. A ball forwards from Naby Keita was flicked deftly by Firmino into the path of Salah who finished clinically into the bottom left corner. 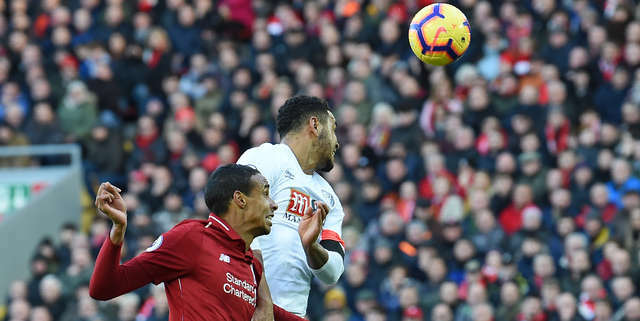 The intensity dropping out of the game with Liverpool able to hold the opponents at arm's length with their lead, Bournemouth doing their best with runs into the box, though none were able to end in a clear chance. Lys Mousset, appearing from the bench with under 20 minutes remaining, linked up with with fellow substitute Dominic Solanke and fired in a shot that just passed the far post. At the other end, Firmino's vision was again in evidence as he set up Salah, the latter smacking a central effort against the top of the bar, while Mousset was soon coming close to a Cherries goal again as he stung Alisson's fingertips with a powerful angled drive. Firmino was sent clear as Liverpool countered late on, his eventual effort lacking the power to beat Boruc, substitute Trent Alexander-Arnold also testing the 'keeper into added-on time. And while Bournemouth's late push for a consolation continued to the final whistle - Solanke drilling a low shot just wide - it wasn't to come as they left Anfield with nothing to show for the efforts. With five goals against the Cherries in his last three games against us, keeping last season's player of the year quiet was always going to be one of Eddie Howe's priorities at Anfield. The Egyptian had a handful of chances in the first half: snatching at two, not making a connection with another and forcing Boruc into a sharp tip-over with a fourth, but the home side's attacking abilities were easily visible elsewhere as they took a two-goal lead in at the break. Three minutes after the second half started, however, there was to be no denying Liverpool's dangerman. Saturday's defeat means the Cherries have now lost their last eight league games away from Vitality Stadium, all since tasting victory so impressively at Craven Cottage in October. While the run has included trips to both Manchester clubs, Wembley and now Anfield, in the short term at least things are unlikely to get much easier, a trip to the Emirates Stadium the Cherries' next road trip - though the season's last five away days are all against sides outside the current top ten.